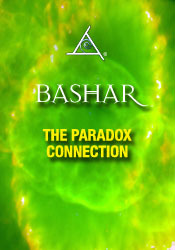 At this annual channeling event, Bashar shares new information on the changes our world will go through between now and 2012 and the opportunity for ET contact that our world is moving toward. He explores activities, such as an Open Contact Law that will increase the probability for contact and provides a surprising guided meditation called "The Paradox Meditation" unlike any heard before! Transmuting the destructive earth changes in the planet's future. Using the symbol of the turtle in one's life. Feeling pain and emotional sensitivity. Being your full self and not being swayed by the attitudes of others. Dealing with depression and other chemical imbalances. Causes of experiencing a lack of money. Non-interference by alien civilizations and the secret government. Creating the world reality you prefer. Stellar objects on a collision course with Earth. Parallel versions of Earth and ourselves and how we experience them. Following your joy and how that creates abundance.